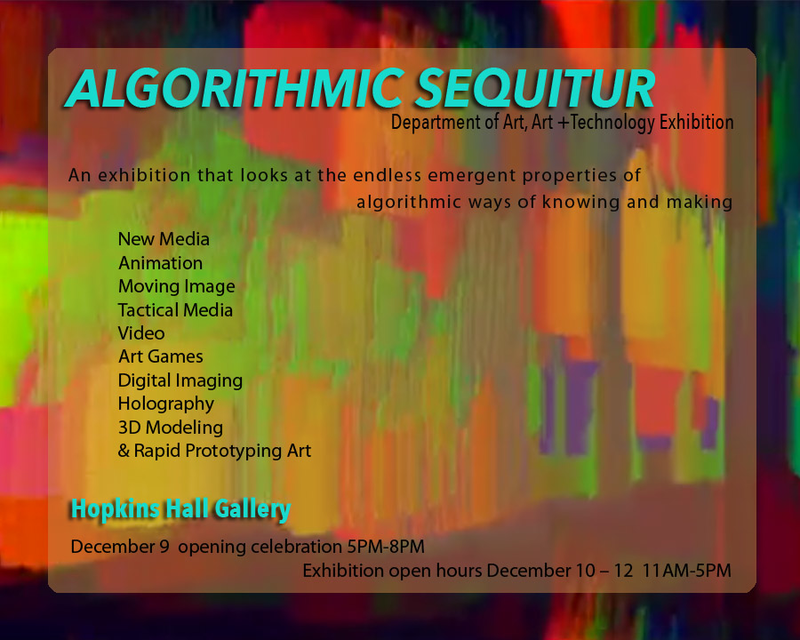 All are invited to Hopkins Hall at the Ohio State University, to see this juried exhibition of student artwork coming from the Autumn semester Art & Technology courses. The action starts on the first floor of the building – in the Hopkins Hall Gallery, the Collaboratory, the corridor, room 156 for moving image art screenings, room 160 and 162 for media installations. The opening night of December 9, from 5pm to 8pm is also the Open House for the entire Department of Art. On the second, third, fourth floors and basement studios of the building, the Department of Art graduate student studios are open for visitors. In the hallways and labs of all floors, student work from all areas of the Department of Art will be on display. From 7pm to 9pm the Open House moves to the Sherman Studios on west campus where Sculpture and Glass student work is showcased. The poster image is a still frame captured from undergraduate student Ty Carroll’s latest video, Ninjitsu. Watch it online, along with his other videos here.